It's hard not to gush too much about this product. I really love it. This is hands down the world's best balance bike for toddlers. The FirstBIKE will last a lifetime so it's great to pass down to all the kids in the family and it won’t look any worse for it. Once you are done they sell very well on eBay so you will recoup some of your investment and pass on a great looking bike! 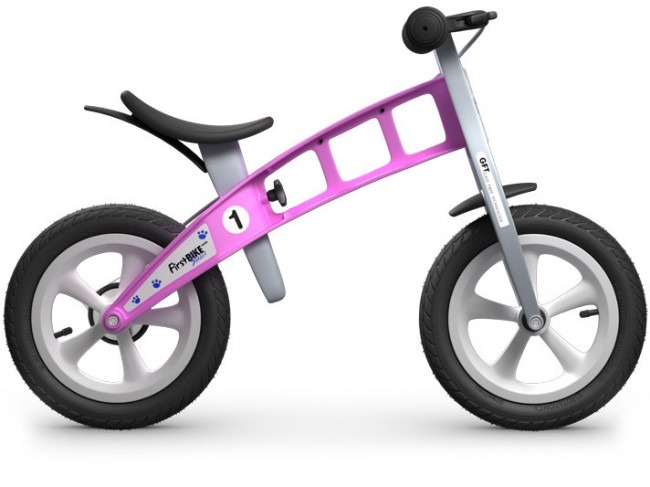 This review is about the multi award winning balance bike that is made from a high-tech, injection-moulded composite frame - the FirstBIKE which means that it doesn't scratch easily, splinter, swell or rust like wood & metal frames. The GFT™ frame is made of 30% glass fibre reinforced nylon composite. The balance bike frame comes with a lifetime guarantee and also means that you can leave it outside in all weather conditions and it won’t fade from constant sun exposure. While riding and it does seem to enable the rider to sit upright in a more natural position. The seat is a non-porous gel covering which is very soft and nice to sit on and which also means that there is no slipping off. The saddle on this FirstBIKEstrider bike can be raised or lowered very easily by a single screw with an easy grip allowing you to adjust the seat height without getting tools out and enabling maximum comfort for the rider again ensuring good posture on the bike. The wheels spin like a racing bike which is in no small part thanks to its sealed bearings which are industrial strength apparently. So when your little one jumps on the bike they need very little effort and they are off! 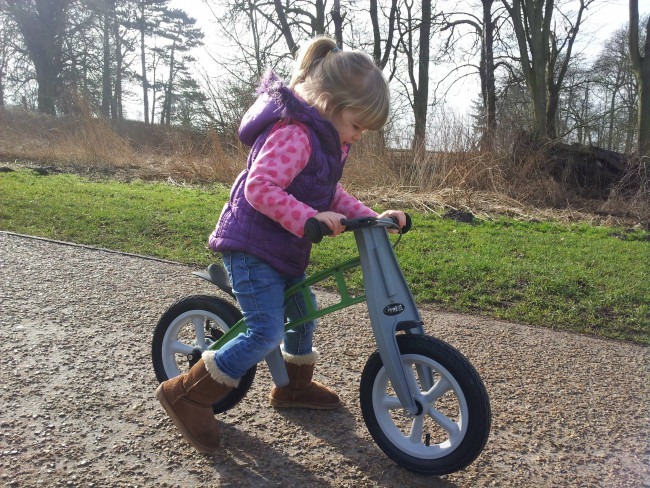 The street models have smoother tires that ride easily on urban surfaces and we saw both for this review, and the smooth balance bike tires work just as well on grass and rougher terrain. they also have the ‘Cross’ tires that give it that edgy off road look. For those that want that big tire look they have tires that are made by SCHWALBE premium pneumatic “Big Apple” tires and Schraeder valves for a smooth ride that come on Limited and Racing editions. Lowering Kit – This is quite an ingenious design which allows the rear wheel to be raised so that younger riders can enjoy the bike. The seat goes from 35cm from the ground to 30cm which makes a huge difference to a two year old when they riding. They are quite simple to attach and only take five minutes. Baskets – The baskets is as you would expect tough. They come in Black, Red, Blue & Pink and are attached via two cable tie straps around the handle bars, which is quite disappointing and feels like an afterthought. But that said they are great for the kids who love to put their toys in there but don’t be letting them overload them with heavy things as they do break the straps. But they are available for couple of pence each from your local hardware shop. Ski Accessory - This is quite a cool accessory if you live in an area that is snowed under for a fair bit of the year. The ski replaces the front wheel and allows your kids to ski around where other bikes fear to tread! all the bolts are recessed so when your little one does fall they are not going to get snagged by any screws or bolts sticking out like some of their competitors. All their models of balance bikes have the option of brakes or no brakes. The brake is a drum brake and is very effective, again with safety in mind, all moving part are safely hidden from curious little fingers. that will ensure that there will be no jack knifing while your little one is still getting to grips with steering in a straight line and in our observations this did not limit any of kid’s manoeuvrability on the balance bikes at all, but this should not be a major consideration in your decision as kids do learn quickly! The grips are again rubber but a little harder than the seat and also have a bumper on the ends that certainly help cushion and protect little hands when they fall over. Because this is such a high quality item that obviously deserves the awards it has been given, it is clear that this bike will last several generations of toddlers and many years of rough treatment out in the yard. In fact, it is hard to put into words what a top quality item this is. 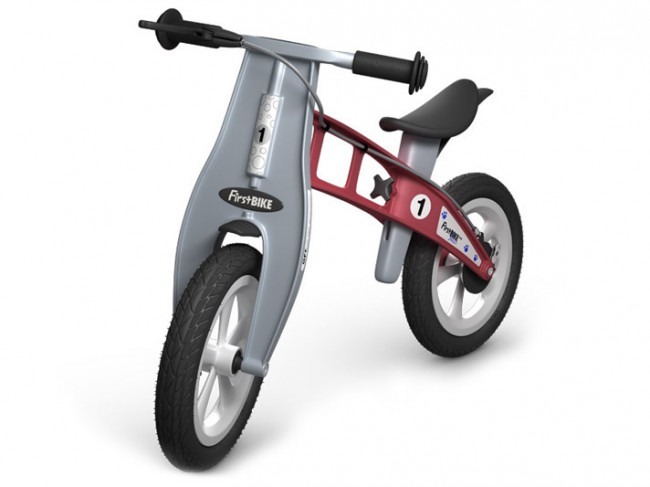 The FirstBIKE is clearly the best balance bike for toddlers on the market but it is also the most expensive. That said, if you do want to own the Rolls Royce of strider bikes and feel proud that your child is riding one in the park - then this it the ride-on for you! So by now you should know that we totally recommend the FIRSTBike. 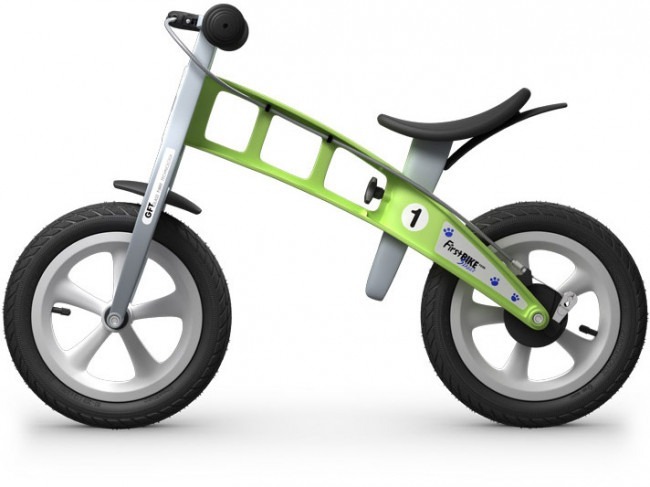 Designed in Germany and Shipped from the USA, it is without doubt the best balance bike on the market today.